Mmmm…comfort food at its best! Cheesy, creamy, salty, crunchy. It hits all the sensors! Preheat oven to 375 degrees. Brown ground beef and drain off grease. Season with House Seasoning, to taste. In a large bowl combine milk and soup. Mix well and add beef. Stir together and pour into greased 9×13 pan. Top with cheese. 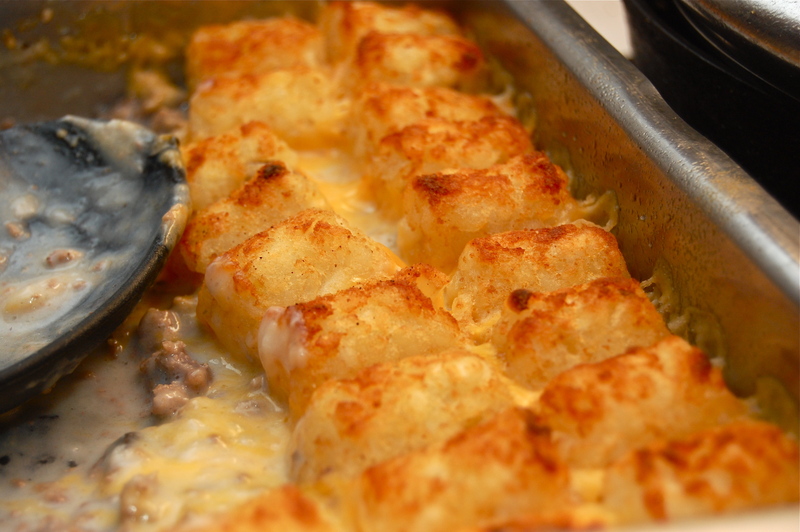 Line up tator tots on top of cheese (you may or may not use all of them). Cook for 30 minutes or until bubbly. Switch oven to Broil. Take out and spray top of tots with butter flavored cooking spray, sprinkle with House Seasoning (or salt & pepper). Return to oven and broil for about 5 minutes or until golden brown.